To reduce the amount of time that dispatchers spend on administrative tasks, by 50 per cent by March 2019. Provides ambulance dispatchers with more time and capacity to focus on delivering life-saving care to people in the community. Provides dispatchers with better, fit-for-purpose tools to manage their administrative duties. Helps dispatchers make better decisions about paramedic meal breaks and overtime, improving compliance with industrial award rules. Reduces the costs associated with meal break penalties and shift overtime. Increases the capacity of dispatchers to monitor the safety and wellbeing of paramedics on the road during their shift. Improves the workplace satisfaction of ambulance dispatchers in NSW. ensuring paramedics sign-off on time and allocating shift overtime when operationally required. In order to do their job effectively, a dispatcher is often required to manage the competing priorities of sending timely and appropriate care to people in the community, while ensuring paramedics have access to meal breaks and minimal exposure to excessive overtime. 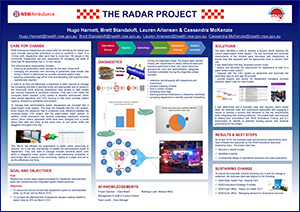 They use a tool called the Computer Aided Dispatch (CAD) system to dispatch ambulances, which uses clinical algorithms and GPS tracking to help them prioritise patient urgency, ambulance availability and location. To manage their administrative duties, dispatchers are provided with a paper-based roster system. This does not integrate with the CAD system, which means the dispatcher has to constantly cross reference between the computer-based CAD system and the paper-based roster system. In addition, NSW Ambulance has recently undertaken significant rostering reform, which means paramedic shifts have been changed from a model where they start and finish at the same time, to one where shifts are staggered throughout the day. This reform has allowed the organisation to better match resourcing to demand, but it has also dramatically increased the administrative duties of dispatchers. They now need to manage complex industrial award rules within a staggered roster system, while cross referencing availability to send timely care to people in the community, relying on a paper and pen to do this effectively and fairly. The project team established an internal project governance structure, to ensure accountability around project deliverables and timelines. This was achieved by using the Accelerated Implementation Methodology principles and establishing both authorising and reinforcing sponsorship for the project. surveying dispatchers to identify potential frustrations. provide support and advice for dispatchers managing complex industrial award rules for meal breaks. It was determined that a business case was required, which would detail the potential costs and implications associated with engaging a vendor to develop a solution that delivered on the key requirements while integrating with existing platforms. The project team was required to extend their consultation with NSW Ambulance Finance and ICT directorates, to identify a potential funding source and financial governance for the project. As of March 2018, the business case has been finalised and has been submitted to the NSW Ambulance executive leadership team for approval. Following approval of the business case, the project team will be in a position to start engaging vendors and developing solutions. the satisfaction of dispatchers in their role (target is to ensure dispatchers feel supported by tools that help them perform their role effectively). The evaluation phase will involve returning to the diagnostic measures used at the start of the project, including process mapping and time in motion studies. It will also assess the level of integration provided by the solution, as well as staff engagement and surveys to measure the impact of the solution on the dispatcher experience. Get executive buy-in early and consult and advocate frequently in order to maintain it. Never underestimate the importance of diagnosing the issue and truly understanding the root causes that lead to bottlenecks in a process. Communicate clearly and often, and most importantly establish a feedback loop through which you can assess whether or not the communication strategy and content is being received in the way you intended.